Israel and the PA work together to respond to horrific bus crash near Jerusalem. At least 10 PA children killed. 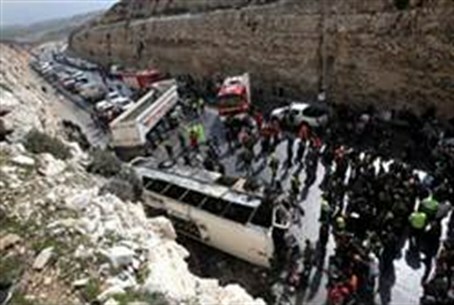 At least ten Palestinian Authority Arab children were killed Thursday morning in a traffic accident north of Jerusalem. A PA bus carrying children collided head-on with a truck driven by an Israeli Arab man. As a result, the bus overturned and caught fire. Israeli first response teams are working alongside the PA to rescue as many victims as possible. Both MDA and Red Crescent ambulances have been working to bring injured children to Israeli hospitals in Jerusalem. Several children managed to escape the burning bus, and are being treated for light injuries. Rescue workers fear that additional bodies may be found within the wreckage of the bus. In addition to conducting joint rescue efforts, Israel and the PA have begun working together to determine the cause of the crash. Investigations have been complicated by the presence of a large crowd in the area.